Every Thursday, Nathan over at Fantasy Review Barn hosts a weekly party where blogs get to follow along with Diana Wynne Jones’ hilarious book The Tough Guide to Fantasyland: The Essential Guide to Fantasy Travel listing their favorite books with a particular fantasy trope. So sit back and enjoy the fun. COMPANIONS… You will normally meet them for the first time at the outset of the tour. They are picked from among the following: Bard, Female Mercenary, Gay mage, Imperious Female, Large Man, serious soldier, Slender Youth, Small Man, Talented Girl, Teenage Boy, Unpleasant Stranger, and Wise Old Stranger. Okay, I’m going to kill this topic! The star of this series might have been Roland the Gunslinger, but it would not have been nearly as enjoyable without his ka-tet of Jake Chambers, Oy, Eddie Dean and Susannah Dean. 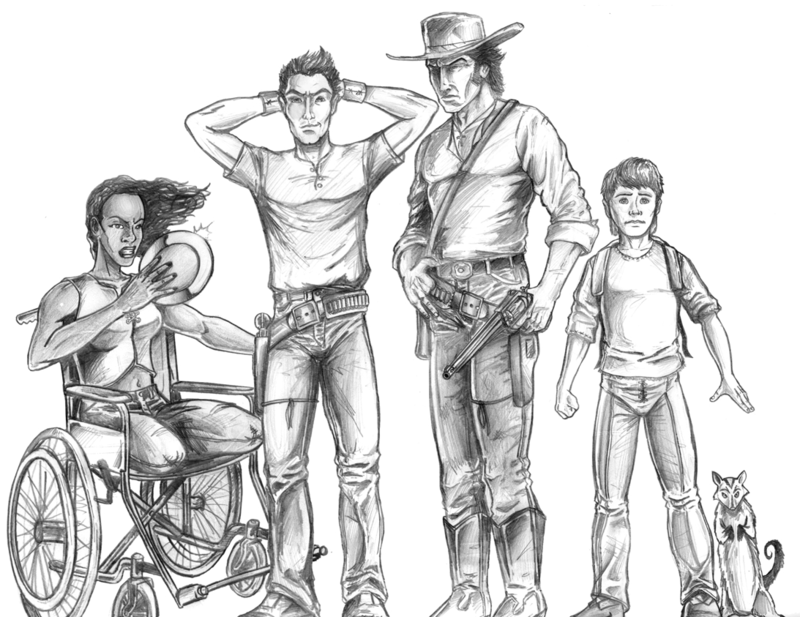 This group of rich kid, drug addict, and wheelchair bound rich girl drove this series forward through the good and bad (No, Mr. King, I have not forgotten nor forgiven the conclusion to The Dark Tower saga), and without them, we all know that Roland Deschain’s quest to reach the Dark Tower would never have succeeded. Honestly, I loved each and every one of these characters for a different way, and I can’t think of any other companions that contributed so much to the series they co-starred in. See my reviews of three of the novels in the series. 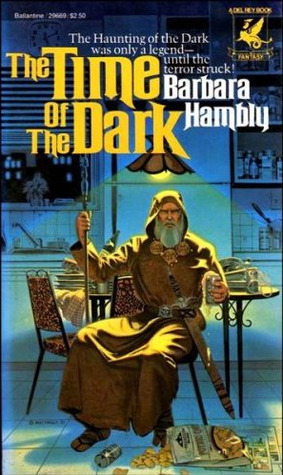 As I’ve said before, this is one of my favorite old school fantasy series with Ingold Inglorion being my favorite wizard this side of Gandalf. Without a doubt, this robed guy has some bad mojo with a staff or a sword, and he has taken upon himself the task of trying to save his entire planet from nearly invisible creatures called the Dark, whose meal of choice is humankind. But you know what? He isn’t the main character in the series. Nope, two, twentieth century Americans are the stars, which made Ingold one of the best companions I’ve ever read about! As this series begins, Croaker is the main character. Naturally, as the annalist of the Black Company, it is his job to write this account of their ongoing exploits in the world. In the first book, a reader sees relatively little of Lady; the second novel is even less; and the third book, she plays a bigger part, especially toward the end. Even in the later books of the series, Lady is rarely the main character, but somehow she always finds a way to steal the spotlight from everyone in the book and is one of the most interesting “companion” characters that I’ve ever read about. I mean, wise old stranger and talented girl are great companions, but how about world conquering sorceress supreme who will kill you as soon as she spits on you but has the grace and sophistication of a true lady? Yeah, I do have a horrid thing for her, which means the Lady is one of my favorite companions. While it might not be completely true, I’d say that all these guys are companions to Frodo, whose quest they join and attempt to help him complete. 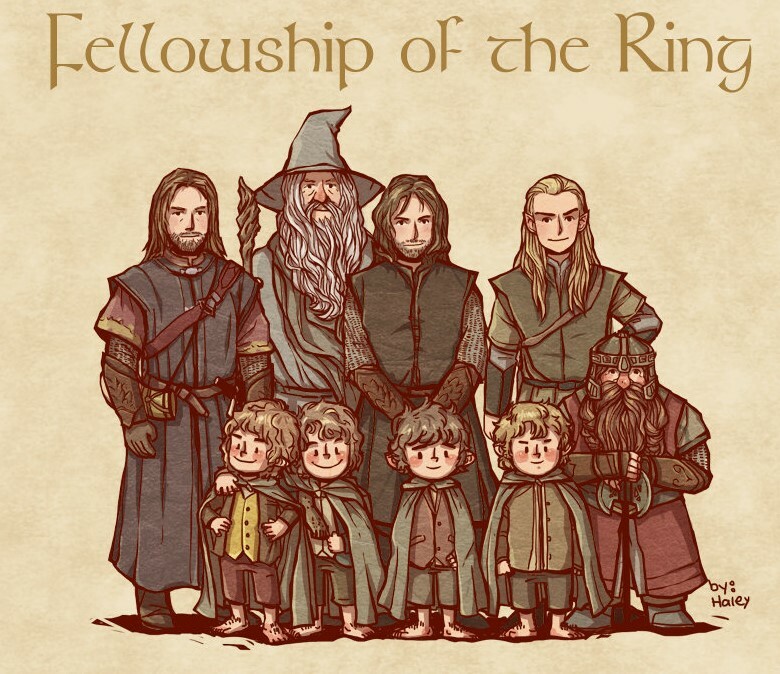 Sure, several of them become the main focus of chapters and chapters of the novels, but to me, they are still merely members of the Fellowship of the Ring, whose job it is to be companions and helpers to the ring-bearer Frodo. 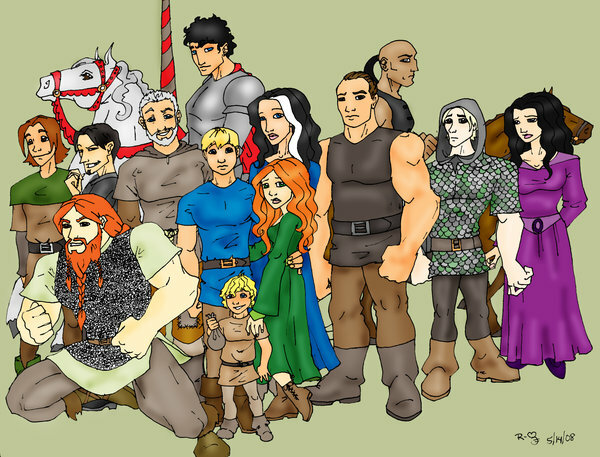 So for those reasons, this group of characters are companions to me, and they will always deserve to be on any list of the best companions in fantasy. Now, Shara Thivani, great granddaughter of the Kaj, and operative for the Saypur Foreign Affairs Ministry is the main character in this fantastic fantasy genre blender, but her bodyguard Sigurd slowly becomes a companion who steals more than a few scenes from Shara. Wild, barbaric and mysterious, this huge man who can wipe out a whole squads of armed men by himself has a shadowy past that is slowly revealed and turns him into something so much more addictive than just the strong, silent murderer. Honestly, this companion really deserves his own novel or at least a novella spotlighting his intriguing life and future. See my review of the first book in the series. I might have come late to the urban fantasy feast, but in Oberon of The Iron Druid Chronicles, I’ve already found my favorite UF companion. 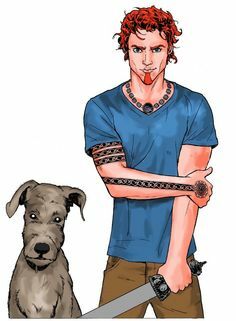 This Irish wolfhound’s constant banter with his human slave, twenty-one centuries old druid Atticus O’Sullivan, is the motor that runs this UF series. Sure, witches and werewolves, gods and goddess, magic and curses are great and all, but you just can’t beat a wisecracking dog, making his human’s life happier and more miserable in turn. As I try to find time to continue my read of The Iron Druid Chronicles, do you know my reason for wanting to do so is? Yeah, I want me some more Oberon. You just beat a talking dog, people. We really need one in every fantasy book. I’ve called the Shader series the best indie fantasy series that I personally have ever read, and while I really adore the hero of the series, Deacon Shader, Nameless (as his friends call him) is the best sword and sorcery companion that I’ve run into lately. This blood drenched dwarf who was so evil that he began to commit genocide of his own people is completely rehabilitated by Mr. Prior, showing himself to be a fighting man’s ideal companion. Nameless drinks, laughs, fights, and embraces nearly everyone in friendship. In fact, he becomes such a shining character that in the third book of the Shader series he began to actually steal the show from the star. Now, Nameless you are just going too damn far there. Companions have to know their place. 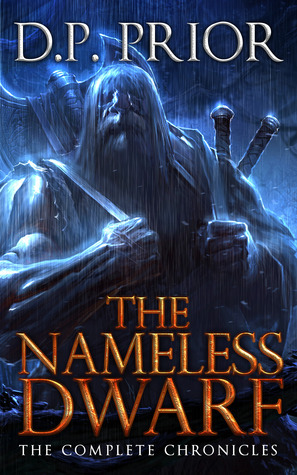 See my reviews of two of the novels featuring The Nameless Dwarf. 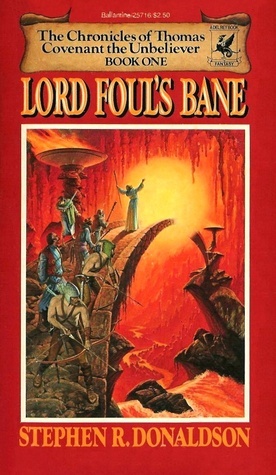 Throughout this series, Mr. Eddings continually adds more and more companions to this group led by Belgarath and Polgara, as they crisscross the world after the stolen Orb of Aldur. Sure, each of these people seem somewhat one dimensional, but even the most cardboard cutout characters has his or her moment to shine and do something necessary for the group as a whole to succeed. So while I wish I could pick just one of these companions, I’m going to throw them all in together. Honestly, how can I pick between Durnik, Silk, Barak, Hettar, Lelldorin, Mandorallen, Ce’Nedra, Relg, Taiba, or Errand, not to even mention Belgarath and Polgara. These guys were all great companions, and some of my favorite Young Adult fantasy characters. This seventh Duke of Corwyn and Lord General of the Royal Armies of Gwynedd is a close advisor and friend of both King Brion Haldane and King Kelson Haldane of the Deryni series. He is a man dedicated to protecting not only his liege lord but also trying to somehow ease the transition of the hated and cursed Deryni people back into society. A warrior, politician, and fast friend, Alaric is one of the most interesting companions that I’ve ever read about. While George R.R. 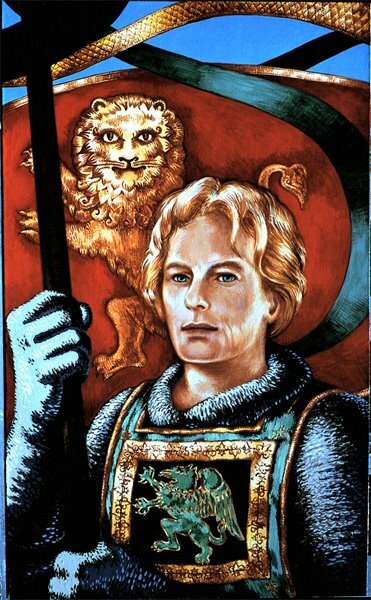 Martin’s Song of Ice and Fire is a masterpiece of medieval noble genocide, Kurtz’ Deryni series is very similar in tone and can’t be beat for royal political treachery and backbiting – with Alaric being a big reason why. These two companions of the whiny leper Thomas Covenant are introduced in the first novel of the series, Lord Foul’s Bane, but they continually grow and change so that by the third novel, The Power That Preserves, they are nearly completely different people. (I suppose, war with a Dark Lord will do that to anyone.) However, throughout their tumultuous relationship with Covenant, they are really some of the best companions that I have ever read. BE SURE TO CHECK OUT MY BEST OF FANTASY LISTS. This entry was posted in Fantasy, Lists, Tough Traveling and tagged Alaric Morgan, Barbara Hambly, best fantasy companions, Chronicles of the Deryni, City of Stairs, Companions, D.P. 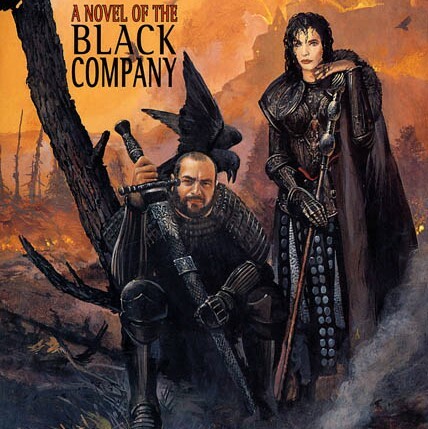 Prior, Darwath, David Eddings, Glen Cook, Ingold Inglorion, Katherine Kurtz, Kevin Hearne, Lady, Lord Mhoram, Lord of the Rings, Oberon, Roland Deschain, Saltheart Foamfollower, SIGURD THE DREYLING, Stephen King, STEPHEN R. DONALDSON, The Belgariad, The Black Company, the dark tower, The Iron Druid Chronicles, The Nameless Dwarf, thomas covenant. Bookmark the permalink. haha, great list – I was gonna include Oberon – I love that dog! In fact I almost had an animal themed companion list but I couldn’t figure it out completely so gave up (doh!). Oberon, Toto, Hedwig, Mr Tumnus – okay, he’s not really an animal! Haha, I should have realized Sigrud would be a popular one this week. And love the inclusion of Oberon as well. Lynn’s idea of an animal companion themed list is awesome, maybe one day we’ll have a pets/animal companion Tough Traveling. 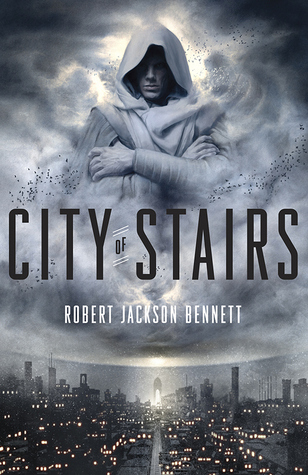 LOT of City of Stairs this week. Guy seems to have made an impression. A fine selection indeed! I was pleased to see that the Nameless Dwarf got a mention. 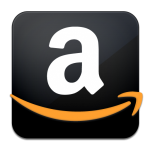 Also, I really like the thumbnail “Buy on Amazon” link!